When I first visited the Blue Ridge Parkway in 1972, I figured that my wife and I could drive the entire 469 miles from Cherokee, NC to the Skyline Drive in Virginia in two days (45 MPH speed limit means roughly 10 hours total drive leaving plenty of time for sightseeing). Well I was mistaken. I soon discovered that there is too much to see to cover in a few days. It took us several years of trips to the Parkway before we had driven all of it. Most of our travels on the Blue Ridge Parkway have been in the fall. The fall colors along the parkway are beautiful and attract people from all across the country. 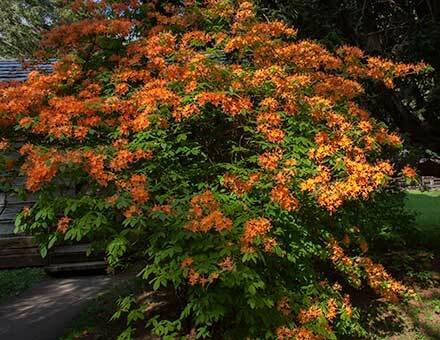 The color season on the Blue Ridge Parkway lasts for several weeks. 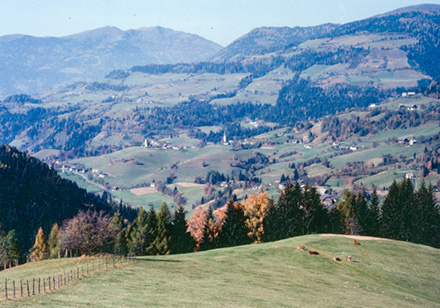 The long season is a combination of the length of the parkway and the differences in elevation. Color changes generally start at the northern (lowest) end of the parkway and end at the southern (highest) end of the parkway. So if you're visiting the parkway looking for fall colors and find that you're too early head north and if you're too late head south. We learned that the drive along the Blue Ridge Parkway needs to be approached as a long term project and not a race. When you drive along you need to pull into the overlooks and admire the view and read to information posted by the park service. And don't forget to take some of the many hikes worth taking. We spent years exploring small sections of the parkway. Each year we'd drive a few miles a day. We found too many vistas worth stopping to admire and too many hikes worth taking. And there are still many hikes and places we haven't visited. We covered some new ground and retraced old favorites. We spent our nights in Mom and Pop Motels in the small towns just off the parkway. Most of the time AAA guides weren't much help but the old Mobile Travel Guides were. It was surprising how many very small towns were covered by the Mobile Travel Guide. I just looked to see if it's still published and it's been renamed the Forbes Travel Guide. Wonder if it has the same great coverage of small towns? On our early trips we carried 35mm Minolta film cameras and a Super 8 Movie Camera. The gear weighed about 100 pounds. Now we carry digital still cameras and HDV digital video camera. Much lighter equipment. The video is almost as good as the Super 8, but it's still not quite there. But it's a whole lot closer than it was when we were shooting VHS. 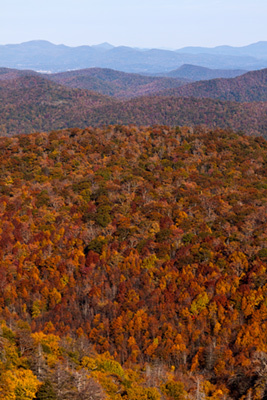 Most of our visits to the Parkway have been in the fall when the fall colors are spectacular. 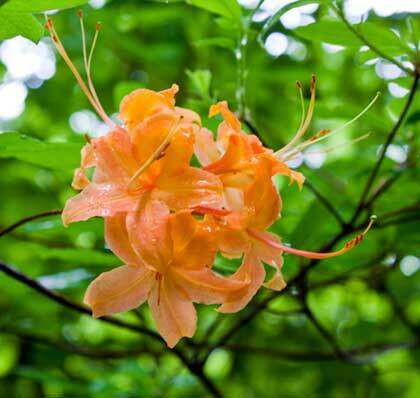 We have made a few short trips in the spring when the azaleas are in bloom, but never at their peak. This is a shortcoming that we hope to remedy soon. 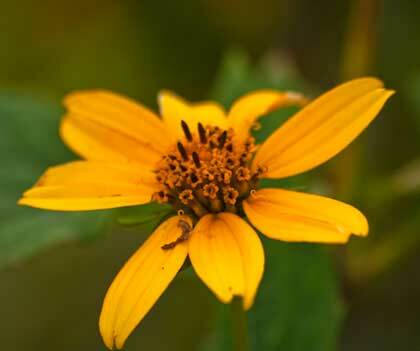 Then there are times when the wild flowers are in bloom. Another season that we have neglected. So we've got a lot of work to do just in our own backyard. There aren't many paddling opportunities on the Parkway. Julian Price Like is it. 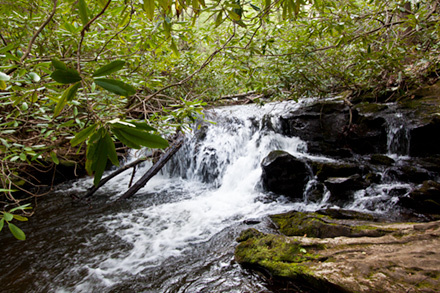 But there are several paddling opportunities not too far from the Blue Ridge Parkway. We hope to combine trips with Nessie or Clem to these paddling spots with additional exploration of the Blue Ridge Parkway. Every overlook on the parkway is worth stopping for and every hike is worth taking, but even so here are a few places you shouldn't miss. Graveyard Fields at milepost 418. 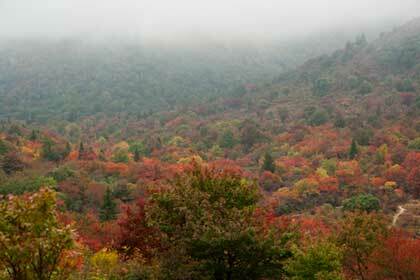 Graveyard Fields is one of most beautiful spots on the whole Blue Ridge Parkway. You really need to take the short hike to the lower Yellowstone Prong Falls and spend some time enjoying the place. I also recommend the hike to the upper falls. This is an easy hike along the Yellowstone Prong. It's a bit of a scramble at the end of the trail to get to the top of the falls. 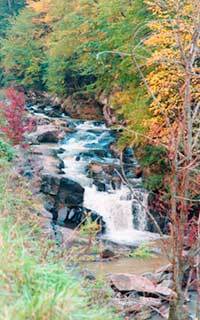 There are several easy to reach campsites along the Yellowstone Prong here. Hike to top of Devil's Courthouse at milepost 422, A moderately steep hike to the top of Devil's Courthouse for a great view of the area around the parkway. The Folk Art Center at mile post 382 near Asheville is a must stop. Crabtree Falls Trail at milepost 340 is a loop trail is one of the nicer waterfalls along the Blue Ridge Parkway. Linville Gorge trailat milepost 316 leads to views of Linville Gorge and waterfalls. The trail is easy. 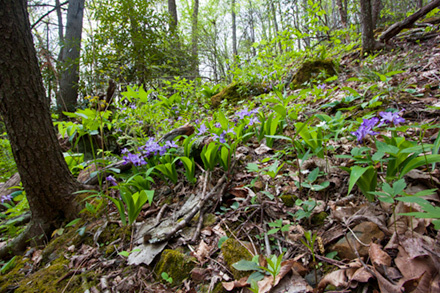 For the adventurous, there is a trail to the bottom of the gorge and the waterfalls. Julian Price Memorial Park at milepost 297 has a lake, trails, camping and picnic area. We Paddled Price Lake. Be sure to stop at the nearby Moses H. Cone Memorial Park where you can see handicraft demonstrations and purchase local crafts. The Northwest Trading Post at milepost 259 is a great place to stop and get out of your car and browse the handmade products and enjoy a ham biscuit. Blue Ridge Music Center at milepost 213 is the place to stop for live music and the history of mountain music. 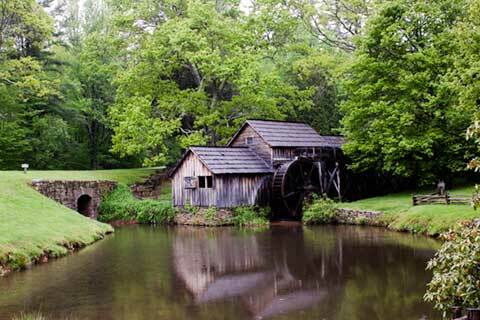 No drive along the Blue Ridge Parkway is complete without a stop at Mabry Mill at milepost 170. The Mabry Mill is probably the most photographed place on the Blue Ridge Parkway.